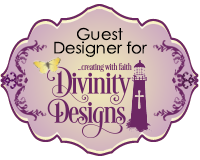 It's my turn to post a tutorial on the Elizabeth Craft Designs blog. With Christmas being less then three months away now, it is time for me to start getting serious about making Christmas cards. 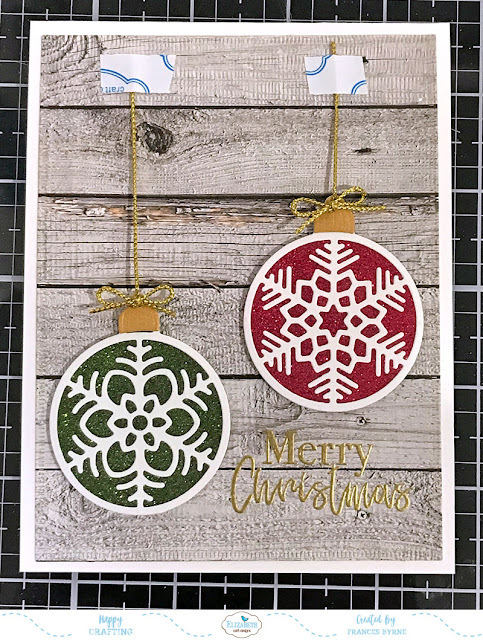 For my card today I have used two of the new winter/Christmas themed dies from the Joset Designs collection released in August. 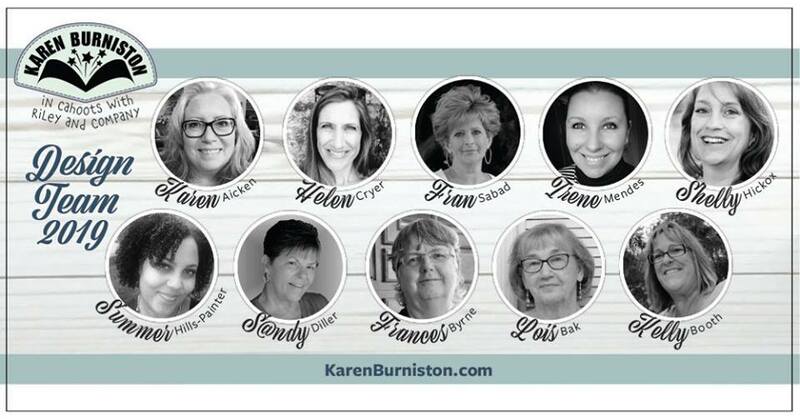 Cut a piece of White Soft Finish Cardstock so it measures 4 1/4 inches x 11 inches. Score along the long side at 5 1/2 inches and fold to create a top folding card. 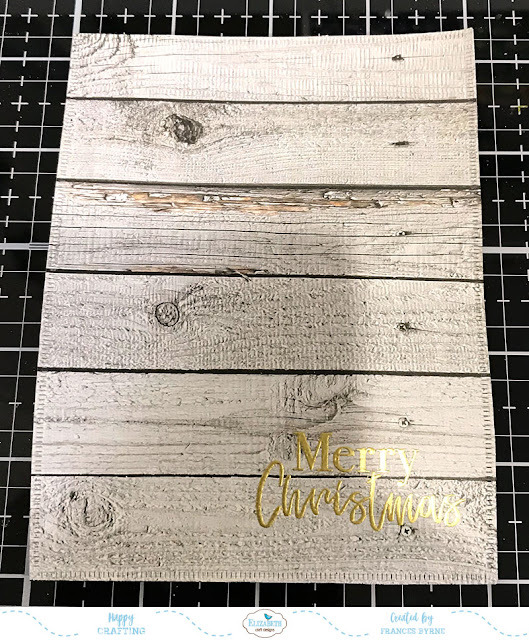 Using the second largest rectangle from the Dashing Rectangles die set, die cut a rectangle from the ModaScrap Wood Effects Patterned Paper (Grey wood background used here). 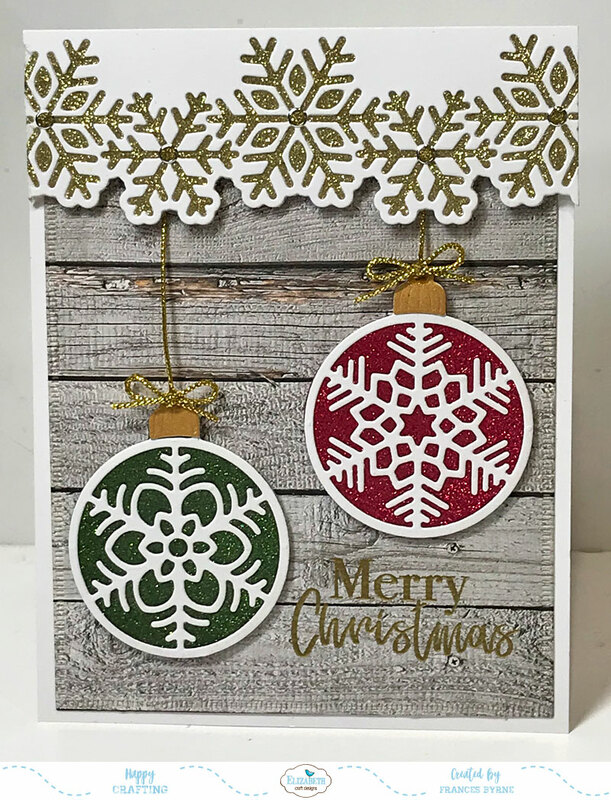 Stamp the "Merry Christmas" Sentiment from the Classic Christmas Sentiments Clear Stamp set to the bottom right hand corner of the card using VersaMark Ink and Gold Embossing Powder. Adhere the patterned paper to folded white card base. Remove the protective backing from the adhesive attached to the front of each of the solid ornaments and attach one of the decorative overlays on top of the ornament being careful to not touch any of the exposed adhesive. 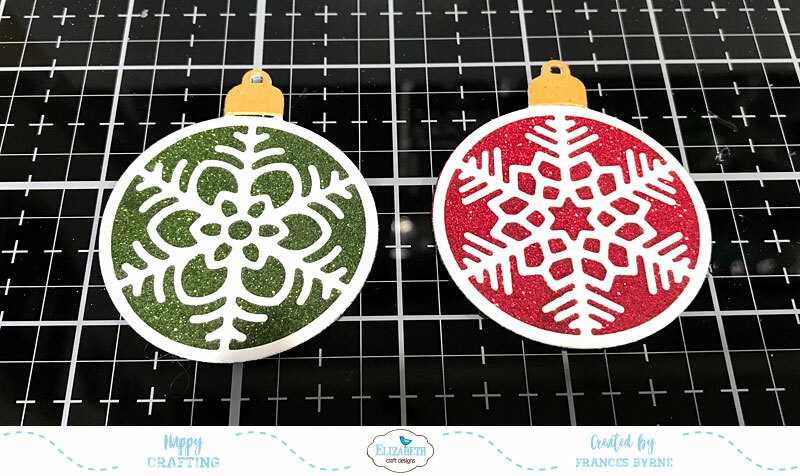 Apply True Red Silk Microfine Glitter to two of the ornaments and Forest Green Silk Microfine Glitter to the third ornament (one of the red ornaments will be for the inside of the card). Remove any excess glitter and return to the jar and then polish the glitter into the adhesive to bring out the maximum sparkle. Adhere gold topper onto each of the ornaments. 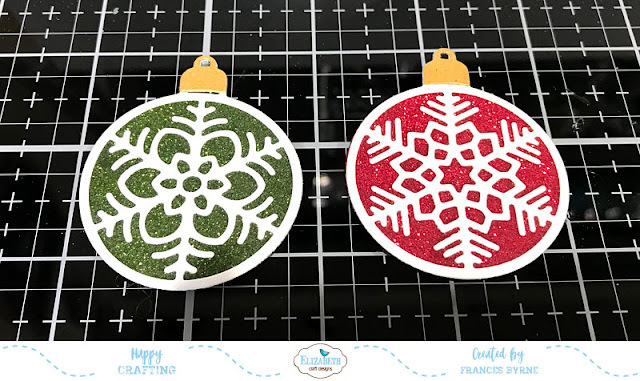 Place foam tape to the back of two of the ornaments (one red and one green). Tread a length of gold cord through the hole of the ornament topper and secure the end of the cord behind the ornament so it can't be seen. 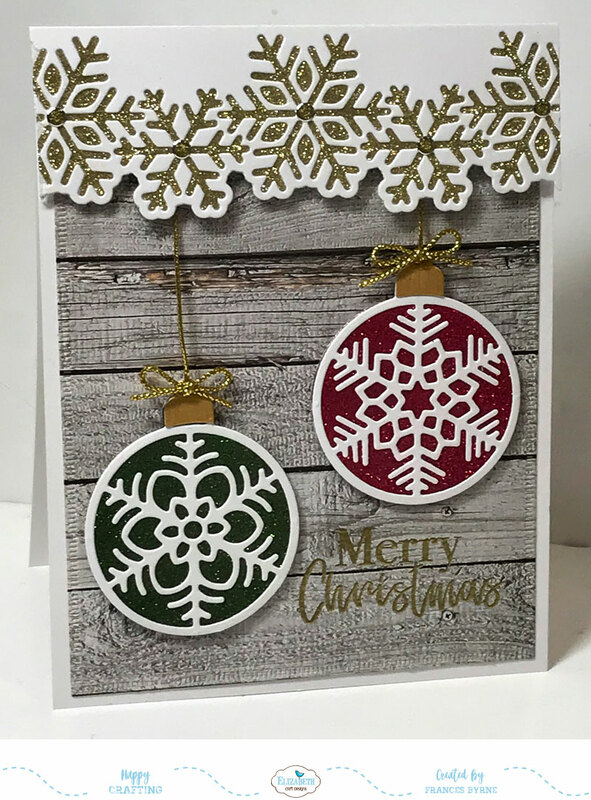 Attach ornaments to card referring to photo above for placement. Secure the other end of the cord to the top of the card using Clear Double Sided Adhesive Tape. Create two tiny gold cord bows and adhere them to the ornament toppers. Using the Snowflake Border die set, die cut the decorative overlay from White Soft Finish Cardstock. 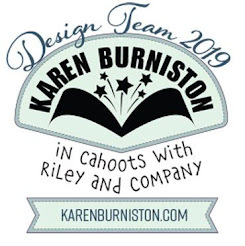 Use the other die in the set to die cut a piece of White Soft Finish Cardstock that has Clear Double Sided Adhesive Tape on the front. 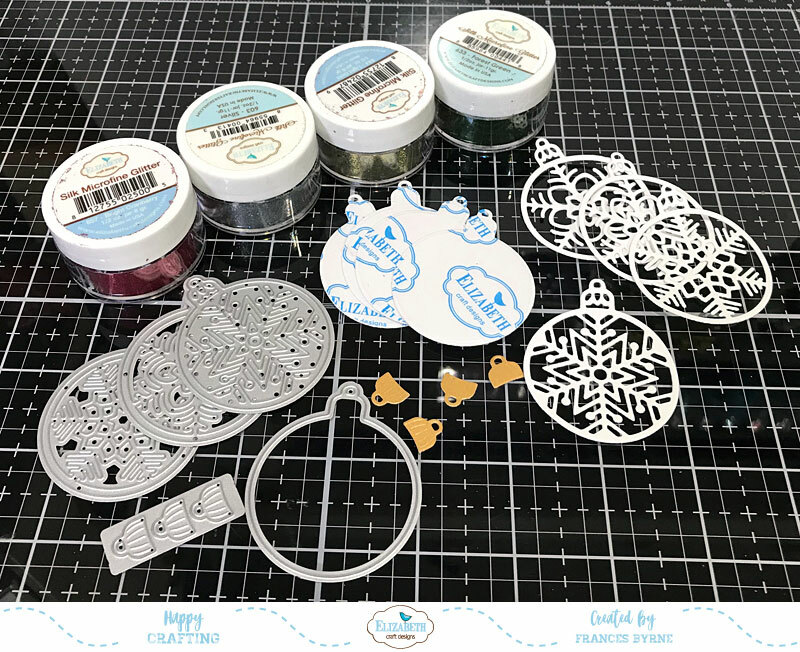 Remove the protective backing from the adhesive and adhere the decorate overlay to the solid panel, being careful to line up die cuts and not touching the exposed adhesive. Cover the adhesive with Light Gold Silk Microfine Glitter, remove excess glitter and return to the jar and then polish the glitter into the adhesive using your finger to get maximum sparkle. Trim Snowflake border so it is 4 1/4 inches x approximately 1 1/2 inches. (Note: before trimming snowflake, make sure you centre it on the card so it is even once trimmed). Apply foam tape to back of the Snowflake Border and adhere to the top of the card. Adhere the remaining ornament to the lower right hand corner of the inside of card. Adhere a Gold Line Border Peel Off Sticker and adhere this from under the ornament topper to the top of the inside of card. 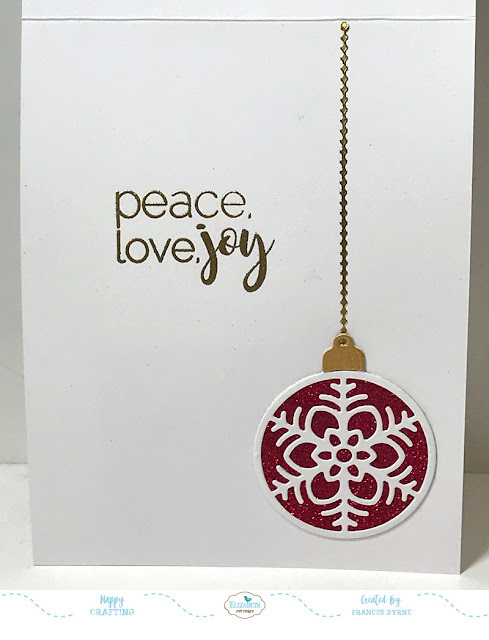 Using the sentiment "Peace, Love, Joy" stamp from the Classic Christmas Sentiments Clear Stamp set to the upper portion of the card using VersaMark Ink and embossing with gold embossing powder.